Because some people follow their passions all the way and walk the extra mile, a lot of inventions, brands and products eventually see the light. 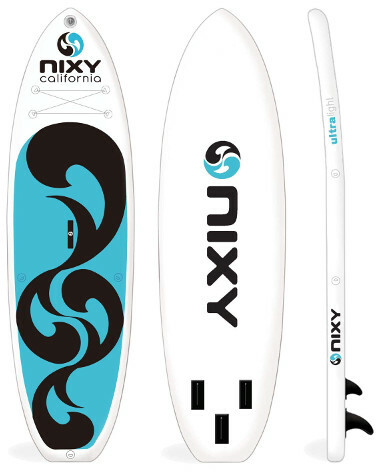 NIXY is a name that founds its way to existence after a Californian family decided to make their own inflatable stand up paddle boards to discover more outdoors properly and professionally. The whole concept behind iSUPs is that the user can experience different things and activities while both having fun and exercising using one single inflatable paddle board in all practicality and versatility. Today’s board is the NIXY Venice iSUP for beginners and yoga, and as you can already see from the pictures; it’s a good looking guy. The Venice is 10 feet and 6 inches long which is personally the perfect match for a beginner. It’s super easy to handle whether it’s deflated or fully inflated. It’s also light weight with only 23 lbs to worry about; a female rider can carry it around single handedly without any inconveniences. In terms of width, the Venice got 34 inches of good space for anyone to practice yoga, lie down or sit. This is the factor that contributes mostly and directly to the board’s stability and performance. As a beginner, you’ll find your way to standing tall in no time while as a yoga enthusiast you’re going to enjoy the professionalism you’ll experience once practicing on this board. Last but not least, any decent iSUP is usually 6 inches thick except for some cases where the board is small, light or meant for specific purposes. The Venice got its thick 6 inches to add to width and create an impressively stable board that can handle weigh very well (300 lbs max). NIXY did a great job with their iSUPs using the advanced Fusion Technology to build each and every one of them. This technology uses an outer tough PVC layer for protection then fuses a liquid PVC layer to the dropstitched core of the board, and in-between each 2 layers, there is a reinforced fused fabric to make the board stiffer and firmer. The dropstitch technology itself is very strong and it’s capable of taking up to 20 PSI without failing. The board will maintain its shape and performance even after years of use and inflating/deflating. 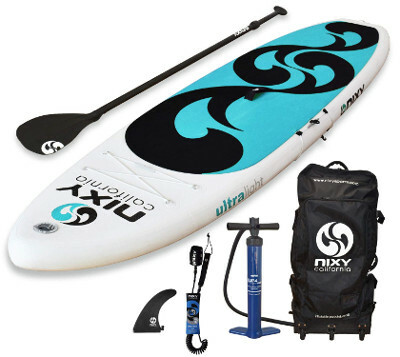 NIXY created an air tight waterproof seal surrounding the whole board’s body to prevent air from leaking in any way. 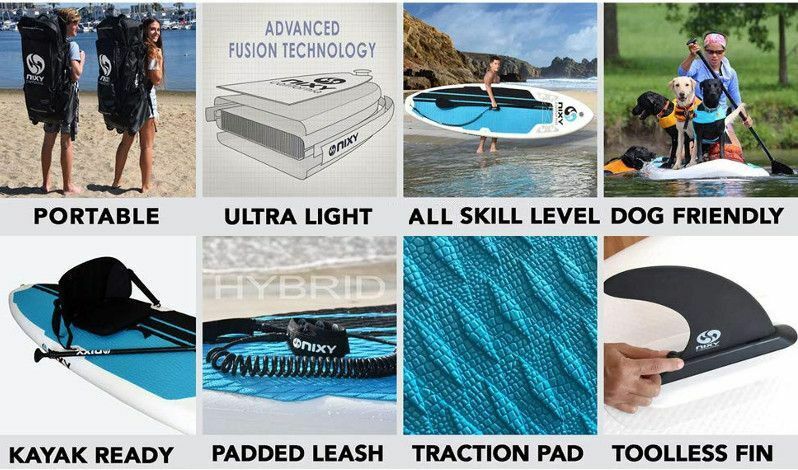 All of this results in a high end inflatable SUP that could be ranked amongst the best in the industry. The Venice comes in 4 awesome colors: Aqua, Blue, Purple and Pink. The design of this board is what you’d call simple and minimal with nicely colored deck pads. Speaking of which, the Venice is featured with a diamond crocodile machine pressed deck pad to ensure that the board’s parts are perfectly bond. The pad covers more than 2 thirds of the board’s back so that the rider can benefit from most of the space there. Also, this pad is soft and rich with great traction effect. The next feature is the front storage area with 4 D-rings and a bungee cord. This feature comes really handy when you need to have some items or equipment on board with you or when you want to stow all of your gear. Another bungee system is on the board’s side with its own D-rings set and a mount clip to allow you more storage if needed. Moving on, the Venice comes with 3 removable fins that need no tools to be attached or detached. The central fin is large like usual while the other 2 are smaller. This navigation system is what makes water tracking effortless and a lot smoother especially in flat water. Finally, there is a High-pressure valve fitting on the board’s front as you’ll also find another D-ring at the end for safety leash attachment, and this right here will lead us to talk about the Venice’s great package. The NIXY Venice is made specifically for beginners who seek balance. This could be one of the most stable iSUPs you’ll ever come across with 34 inches width and 6 inches thickness. It’s not easy to make this board flip; it’s a rigid board that can handle weight very professionally allowing users to practice different routines and positions. In addition to that, the Venice is highly responsive with great potential for maneuverability. The navigation system is great for tracking in flat water which makes paddling a lot more fun; you’ll be moving around almost effortlessly. Moreover, the NIXY boards are not known for being slow; even though the Venice is a beginner/yoga’s board, it moves fast and swiftly allowing you to not only play yoga but also have yourself some recreational touring which is great a full body workout. A 3-piece adjustable Aluminum Paddle with a comfortable T-grip and a fiberglass reinforced nylon blade. It’s floatable and it goes from 67″ to 82″. A Bravo high-pressure double action pump. A 10′ NIXY hybrid leash with super stretch nylon connectors. An awesome NIXY wheeled backpack for easy transportation. The NIXY boards are some of the toughest iSUPs on the market. The Venice is an outstanding beginner/yoga iSUP. It’s super stable and extremely durable. There’s a front storage area and a side-bungee system. It comes in a perfect complete package. The backpack is wheeled and strong to handle travelling. The paddle is adjustable and floatable. It’s quite hard to find something to say at this point that’s why we’ll just leave it here until there’s something worth mentioning. You might want to buy in an electric pump to save yourself from the the hassle of manually inflating this iSUP.